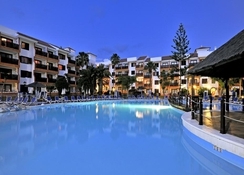 Globales Tamaimo Tropical is a fantastic hotel in Puerto Santiago, located between Los Gigantes and the beach of Playa de la Arena on the coast of Tenerife. With the imposing Gigantes cliff serving as a majestic backdrop, the hotel overlooks the glittering Atlantic Ocean. This 3-star, all-inclusive family-friendly resort is set amid tranquil natural surroundings and offers a variety of accommodation options to choose from including comfortable studio apartments, one-bed apartments and family rooms. The all-round complex at Globales Tamaimo Tropical has plenty of leisure and recreational amenities for both adults as well as kids. 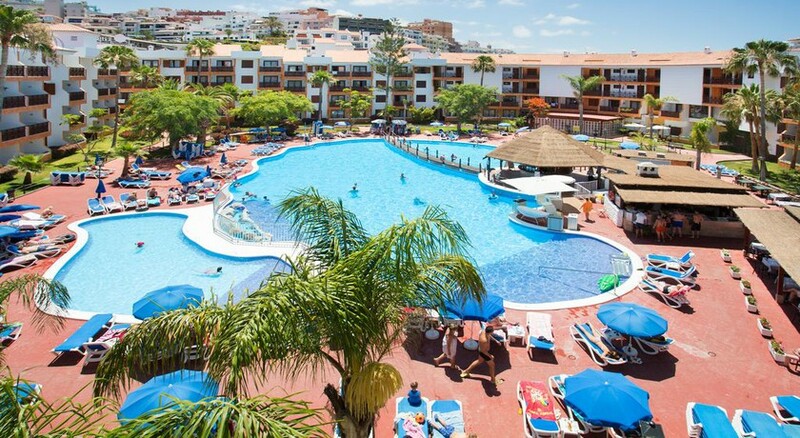 The facilities on offer include delightful restaurants, various bars, five swimming pools, solariums and sun loungers, Jacuzzi, a range of outdoor and indoor sports, mini club for children and evening entertainment programmes for all age groups. Globales Tamaimo Tropical is located in Puerto Santiago (Tenerife) close to the Los Gigantes cliff and overlooks the Atlantic. The rocky beach is just 100m below. The nearest harbour is 1.6km away and Tenerife South airport is just 45km away. You will find an abundance of bars, restaurants and cafes in the surrounding area and the nearest beach is only a 20 minute or so walk from the hotel. Globales Tamaimo Tropical has 372 modern apartments and studios, some of which offer amazing views of the surrounding area. There are 46 Studios, 284 One and Two Bedroom and Apartments. The rooms are equipped with en-suite bathrooms, a TV with satellite, hairdryer, fridge, safe deposit, Wi-Fi internet, sofa bed, fan, lounge and telephone. The apartments have a well-furnished kitchenette area too where you can make basic meals and snacks. Globales Tamaimo Tropical has two restaurants that serve breakfast, lunch and dinner. One of these restaurants is a buffet restaurant and the other, an Italian. The former hosts weekly themed dinners and serves local and international cuisine. There are also two poolside bars, a disco bar and a snack grill bar that serves alcoholic and non-alcoholic drinks. You will find a wide variety of different local bars and restaurants just a few minutes’ walk from the Globales Tamaimo Tropical and the area around the Playa La Arena has lots of great spots for eating and drinking. The hotel has no less than 5 swimming pools where guests can splash in the water before heading to the solarium to lounge. There is a kid’s club that will keep the children entertained during the day and at the Globales Tamaimo Tropical you will also find facilities for table tennis, billiards, darts, tennis as well as a Jacuzzi. The hotel also hosts weekly animation programmes. Food was great, staff were so cheerful and helpful and we just loved the hotel and swimming pools. Would definitely go back. This is an okay place but too many feral kids are around.